Woodrow Wilson was born on December 28, 1856. In honor of his birthday, we have two picks for you this week! The first is, of course, our children’s book Old Ike: The Fictionalized Story of Woodrow Wilson’s Ram. The book details Wilson’s second term in office through the eyes of the ram Wilson brought to the White House for a publicity stunt in 1917. It’s ideal for middle-grade readers, but it will hopefully appeal to adults curious about presidential pets as well. When I was writing this book, I did quite a bit of research on President Wilson. The most interesting source I found was Madam President: The Secret Presidency of Edith Wilson, by William Hazelgrove. This well-researched biography focuses on the relationship between the president and Edith Bolling, whom he met after the death of his first wife. Edith was a pioneer, a businesswoman who drove an electric car. (She was the first woman in the District of Colombia to receive a driver’s license.) Wilson was drawn to her immediately. By all accounts, theirs was a passionate romance between intellectual equals. When the president suffered a stroke while touring to promote the League of Nations, Edith found herself in a rare position: she became the gatekeeper to the president, seeking both to relieve his stress and prevent the full extent of his illness from becoming known. She made decisions on his behalf, delegated tasks to cabinet members, and even forged Wilson’s signature on legislation. Essentially, she became our country’s chief executive–our first (if unofficial) female president. Wilson was considered one of the great presidents for much of the 20th century, though his reputation has declined in recent years. Hazelgrove’s book does not attempt a rehabilitation, but it offers a fascinating look at the strong woman behind the man and provides a fine overview of the Wilson Era for those with only a cursory knowledge of the period. Old Ike charges onto the scene! The Presidential Pet Museum is proud to announce the arrival of their new children’s book series, POTUS PETS! Come, learn about United States history through the eyes of the White House’s wildest residents–the presidents’ animals! In the first book of the series, Old Ike, readers meet Woodrow Wilson’s cantankerous, tobacco-chewing ram who was brought to Washington to help win World War I. What place does a ram have on the White House lawn? How can the world be made safe for democracy? Will the president’s rose bushes survive? Old Ike was written by the Presidential Pet Museum’s historian-in-residence, Andrew Hager, as a way to introduce children in grades 4-6 to American history. With gentle humor and gorgeous illustration from Nora Sawyer, the book vividly presents the issues of the Wilson presidency through Ike’s fictionalized adventures. Soon to be available via, Kindle ebook and audiobook. 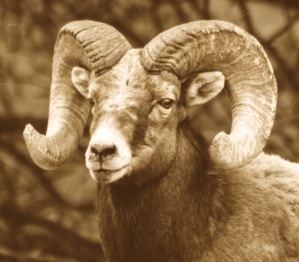 Stock photo of a ram. Old Ike probably looked something like this. But with a cigar in his mouth. Although he ran for office in 1916 on a pledge to not get America into World War I, Woodrow Wilson found it impossible to keep his nation neutral in the growing conflict in Europe. One of the unique ways our 28th president showed support for the war effort was with a herd of White House sheep, led by an ornery Shropshire ram named Old Ike. And how did a bunch of sheep help the war, you may ask? First, the grazing sheep freed the White House gardeners to join the war effort. Second, Wilson auctioned off the flock’s fleece. Although many other presidents had kept farm animals on White House grounds, Wilson was the first to use them to help the country’s finances. Photos and even a film clip exist of the herd — which numbered as many as 48 at one time, according to the White House Historical Association — contentedly grazing in front of the mansion. At auction in 1919, their combined fleece earned $52,823 for the Red Cross, a huge sum at the time. The next year, 185 pounds of wool was donated to the Salvation Army. As the nation went through wartime rationing, the Wilsons also discontinued entertaining at the White House, and the First Lady, Edith Wilson, instituted no-meat days, no-heat days, and no-gas days. Let’s clear one thing up. Old Ike the ram was not very nice. In fact, he had a reputation for being quite mean. According to a newspaper account in 1920, the purebred ram was “forceful and strategic,” charging White House staff and police from all directions. Eventually, President Wilson banished Old Ike from the White House, sending him to Maryland. The rest of the herd was disbanded as well — they had all been part of the presidential scene for just two years. Old Ike had a penchant during his White House days for chewing tobacco — actually, cigars. He would chew discarded cigar butts whenever he could find them. According to an obituary in the Spartanburg (S.C.) Herald, in 1927, as the old ram neared death, his caretaker gave him one final chew of tobacco, “and he dropped off peacefully munching it.” The newspaper added that his death was simply old age. There were sheep that grazed on the White House lawn during Woodrow Wilson‘s administration. To cut groundskeeping costs during World War I, President Wilson (1913-21) brought a flock of sheep to trim the White House grounds. 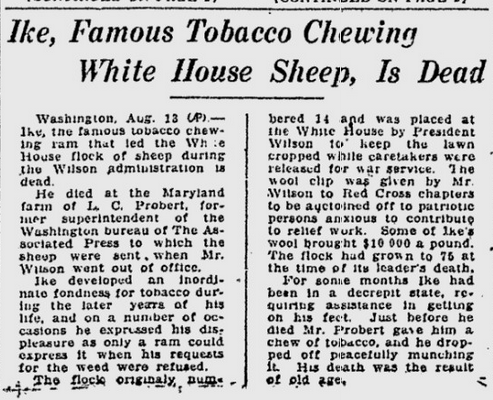 Included in the flock was Old Ike, a tobacco-chewing ram. Pictured next to the West Wing is a mound of wool from President Woodrow Wilson’s sheep.